Local telecom giant Dhiraagu has been appointed telecom partner to the first international conference for the Maldives’ health industry. Titled “EBP Health Champions Conference”, the conference is a programme for doctors, nurses and other personnel of the health industry to discuss the import of research in their field. The conference will also shed light on healthcare methods and procedures based on the latest research. 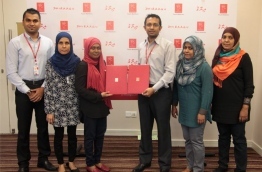 Dhiraagu and the conference’s organiser Evidence Based Practice (EBP) Health Champions Maldives signed the agreement to appoint Dhiraagu as its telecom partner on Saturday. Speaking after the contract signing, the head of the organisation committee Dr Fathimath Shifaza said that the role of technology is lagging in the Maldives’ health sector, noting that lack of good internet connection in health institutions frequently bars access to online researches and databases for doctors and nurses in the archipelago. Dr Shifaza also disclosed that Dr Victor Montori, a prominent Professor of Medicine at the Mayo Clinic in Minnesota, USA, will also give a lecture via Skype during the conference. “Since such a segment is included in our workshop, we believe that the company we can most rely on to provide good connectivity for now is Dhiraagu,” she said. Speaking at the ceremony, Dhiraagu’s public relations manager Imjad Jaleel stated that it is a pleasure for the company to be telecom partner to an international conference starring globally renowned veterans. “A platform such as this offers the opportunity for the work force of Maldives’ health sector to expand their knowledge and skills, and pass on that information to other entities in the country as well,” he said. The conference will feature lectures and Q-and-A sessions with experts from international hospitals and universities situated in Australia, Netherlands, India and the Middle East. Over 150 people are to participate in the conference including doctors and nurses from capital Male, suburbs Villimale and Hulhumale, and from overseas.